2-Mary Ann Walker was born on 1 Aug 1849 in Greenhills, Hagley, Tasmania, died on 20 Sep 1910 in Lenna, Hagley, Tasmania at age 61, and was buried in Sep 1910 in St. Marys Church of England, Hagley. 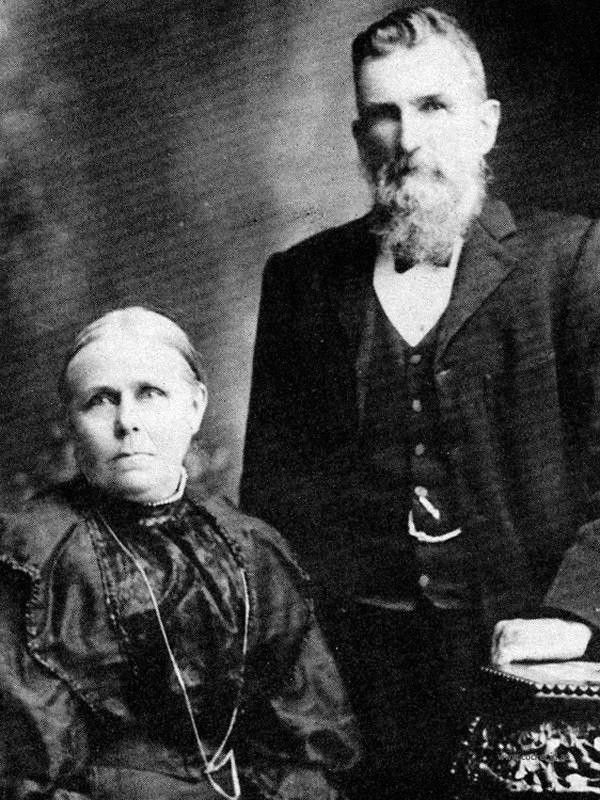 Mary married Isaac Simeon Richardson, son of Isaac Richardson and Matilda Bonner, on 29 Jun 1871 in Home of Michael Walker, Westbury, Tasmania. Isaac was born on 22 Sep 1843 in Campbell Town, Tasmania, died on 6 Jul 1919 at age 75, and was buried in Jul 1919 in St. Marys Church of England, Hagley. Isaac Simeon Richardson was born at Campbell Town on 2nd September, 1843, son of Isaac and Matilda Richardson. Isaac (28) and his brother Simeon (25), were in 1831 charged with demanding money and convicted of stealing and sent to Van Diemen's Land for life. Simeon was often in trouble and placed in stocks or flogged. Isaac was sent to a farm at Campbell Town and caused no more trouble other than surrendering arms to two men whilst in pursuit of bushrangers, but the case was dismissed. 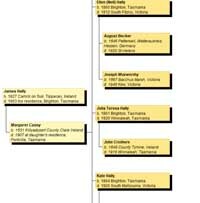 In 1838, Isaac was granted a ticket of leave and his wife Matilda with his son Edward (born 1828) and daughter Ester (born 1930) came out from England. 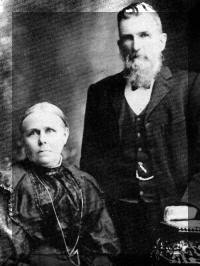 Nothing is known of Isaac's early life but he married Mary Ann Walker on 29th June, 1871. They lived at a property known as Paddy's Scrub, Osmaston. Later they rented a property known as "Back Farm" at Exton. In 1907 they bought a property at Hagley known as "Cripplegate" which was later renamed "Lenna". Isaac and Mary produced eight sons and three daughters — although Albert Edward lived only one month/When they grew to manhood these seven sons — Alfred, Clarence, Frank, Henry, Norman, Arthur and Victor — walked abreast along Hagley Street one Sunday School Anniversary day and it was said that a finer family with their tall even stature and broad shoulders were never seen there before. Isaac worked himself very hard and also his sons in pioneering the land. Each of his sons in turn became hard working, but progressive farmers. Isaac seemed to carry peppermint sweets around with him and found great amusement in giving his young grandchildren a lolly and watching them grimace at the strong flavour. Mary Ann died of a heart attack at "Lenna" on September 20th, 1910. Because there had been a great deal of rain the Methodist cemetery was flooded and unusable so she was buried in the Church of England cemetery at Hagley. Isaac Simeon was also buried there after his death on July 6th, 1919. About 40 years later their grandchildren erected a headstone on the spot. Mary Ann Walker and Isaac Richardson were married on 29th June, 1871, at the house of Michael Walker in the presence of Henry Dobson and Sarah Ann Walker. They are buried at St. Mary's Church of England, Hagley.